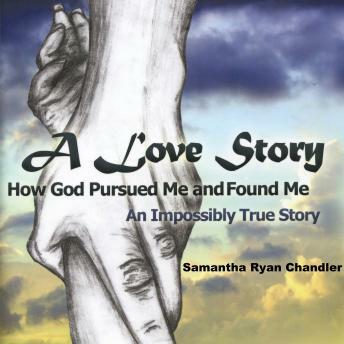 The tale of Samantha Ryan Chandler's life is evocatively portrayed in her book: A Love Story, How God Pursued Me and Found Me. It tells of a life that is as disturbing and unsettling as it is uplifting and, in the end, gratifying. How "A girl from Nowhere, Louisiana" finds her way from such humble beginnings to live and walk amongst presidents and the supremely rich, only to find her trust and faith betrayed by those that she loved and trusted the most. She would be tested to the point where she began to doubt her own sanity and, at the moment of her greatest desperation and doubt, she was found by God and brought back from the brink of hopeless despair. Blessed with an almost unquenchable optimism and a unique sense of humor, she relates the story of a life that will speak to those who have encountered abuse, unfairness and anguish. Her love for her children and her faith in God carried her through a crucible of fire and in the end, made her a better, stronger person, ready to carry on with a life that is again filled with love, joy and laughter. A Love Story, How God Pursued Me and Found Me will both inspire you and touch your heart.